What to do there? Be greeted with the mesmerizing view of the green paddy fields as you pass by the state of Kedah, in the northern part of Peninsular Malaysia. It is affectionately known as the country's rice bowl due to the mass paddy fields and export of rice as main source of economy for the state. 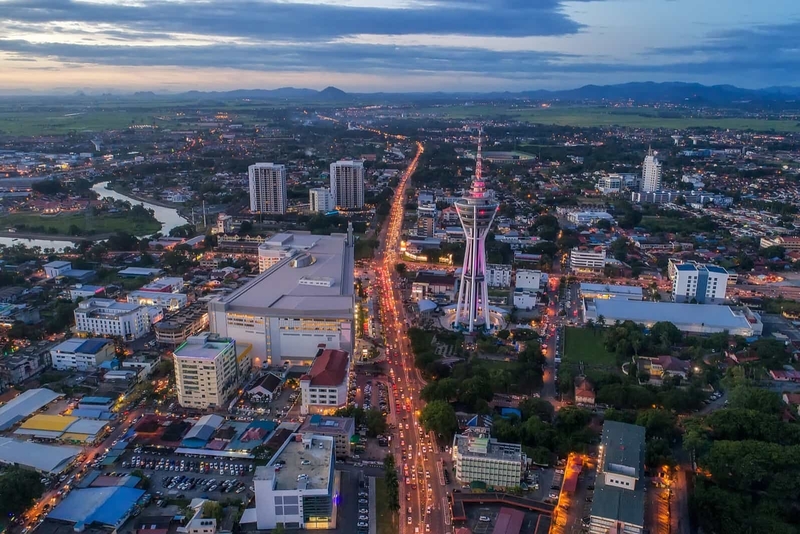 The state capital is Alor Setar and Kedah borders neighbouring Perlis state on the north and shares international border with Songkhla and Yala in Thailand. You can go island hopping, or even stay for a few nights in the Langkawi Island, also known as the Jewel of Kedah. The tropical archipelago of islands that is worth a trip for its lush jungles, sandy white beaches of Tanjung Rhu, the party atmosphere of Chenang Beach, and the many duty free shopping malls available in Kuah town. The town of Alor Setar offers plenty of heritage adventures like historical sights and landmarks. Apart from that, the food here is a boon too, with a fusion of Malay and Thai influences mixed with a dash of Indian and you will get a gastronomic feast in Alor Setar if you are a food lover! Before you head back, be sure to get your munch on at Nasi Royale. In need of an outdoor escape? Hike or camp at Mount Jerai where you can also visit the stunning Alur Naga Waterfall. With an hour drive from Alor Setar, the town of Merbok offers plenty of nature activities at the Merbok Mangrove Forest by a river cruise. Another place worth discovering is the Tupah Recreational Forest. Yan district in Kedah also offers an exciting eco-tourism experiences, apart from other places that are worth exploring such as Sungai Petani and Kulim. Here, you can expect to get local experience at best. For a cross border excursion to Thailand, head to Bukit Kayu Hitam - the border town between Kedah and Thailand. What to see there? As the oldest state in Malaysia, Kedah holds plenty of thrilling history that is amazing to discover. See one of the grandest and oldest mosque in Kedah at Zahir Mosque. As you tour the city, make sure to stop by other interesting attractions such as Royal Hall, Royal Museum, Nobat Tower and Alor Setar Clock Tower. To enjoy some shopping and local delicacies, Pekan Rabu Complex is one of the best spots in town. If you are looking for an exciting holiday, Langkawi Island which was accorded World Geopark status by UNESCO is the perfect destination. Check out its main conservation areas: Machincang Cambrian Geoforest Park, Kilim Karst Geoforest Park and Dayang Bunting Marble Geoforest Park. All of which offers plenty of wildlife spotting, scenic boat rides and sleeping under the stars! Other places of history worth seeing is the Bujang Valley or locally known as Lembah Bujang. Being the richest archeological area in Malaysia, it is said to house the oldest remains of Hindu-Buddhist artifacts. If you fancy a more laid back getaway, visit Pedu Lake; the largest man made lake in Kedah.For a remarkable nature sightseeing experience, visit the unspoiled islands at Yan, Kedah. Some of which you can explore including Bidan Island, Telur Island, Bunting Island and Sonsong Island. On average, the temperatures are always high. Be prepared with light and comfortable clothing for your adventure in Kedah. During the months of August to November, you are most likely to experience a more pleasant weather with average temperatures. The best time to visit Langkawi Island to enjoy outdoor experiences is from January to March. Monsoon season is towards the end of the year, as well as the peak season for international tourists. Ensure that you are properly dressed and bring a pair of scarf or shawl (for women) in case you are visiting religious sites in Kedah. The best time to go around Kedah is by renting a car. If you are travelling alone, a ride-hailing app such as Grab and Uber works in major towns. To bring home packed food, sweets such as Dodol, Kuih Karas, and Bahulu are great as gifts. You can even buy it for munchies on your trip! These can be easily found in malls or complexes. There are a lot more accommodation options in Alor Setar and Langkawi, ranging from hotels, hostels, and chalets on the islands. For other parts of Kedah, there are also hotels and you can find plenty of local homestays too. Aside from the famous Langkawi Island, the state of Kedah is home to other exciting destinations, so stay a little longer to explore the unbeaten path of Kedah!